Wow! 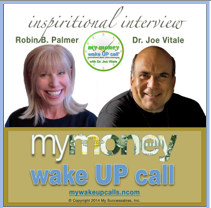 Thank you again for the OUTSTANDING response to the Awaken to Money Inspirational Interview with Dr. Joe Vitale! You will LOVE this new information! Want to find out how you can automatically start every day with a money-manifesting mindset, first thing in the morning, when it matters the most? Just go listen to the audio replay where I discuss it all with Robin Palmer. You will love what we shared — *and* you will get to listen to an actual morning message, too! When you listen to the interview, you will also get to hear an actual morning message made by me. You’ll note that it is more a “lesson a day” than a simple pep talk.